If you were still doubting it, 2018 just proved that Ba Na Hills, if not the must-see place in Da Nang, then it’s certainly the most attractive right now. The opening of Golden Bridge has given Ba Na hills the popularity like never before. But if you don’t know much about Ba Na Hills other than the Golden Bridge, then our article will help you to spend a wonderful day here. Are you ready? 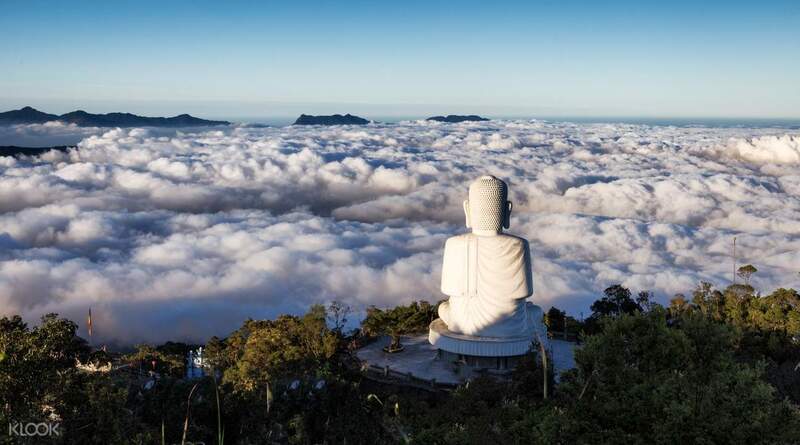 Located just 35 kilometers away from Da Nang city on Nui Chua mountain, Ba Na Hills is a favorite resort and tourist destination to domestic and foreign travelers alike. 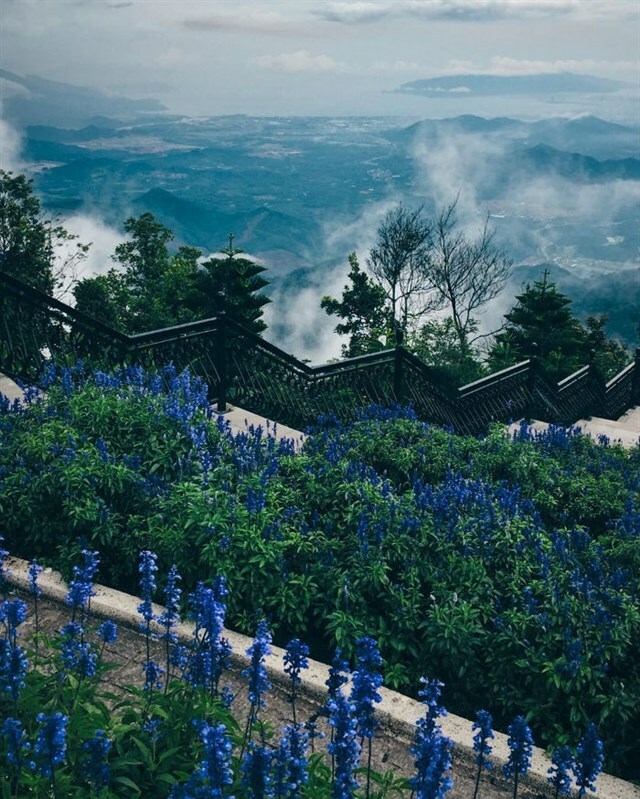 Enjoying a cool and moderate climate, Ba Na Hill station was praised as ‘Da Lat of Da Nang city’ ever since the hill station’s inauguration in 1919, built by the French colonists. The name ‘Ba Na’ comes from Katu language of the local ethnic minority group residing in the area, which means ‘my mountain’. 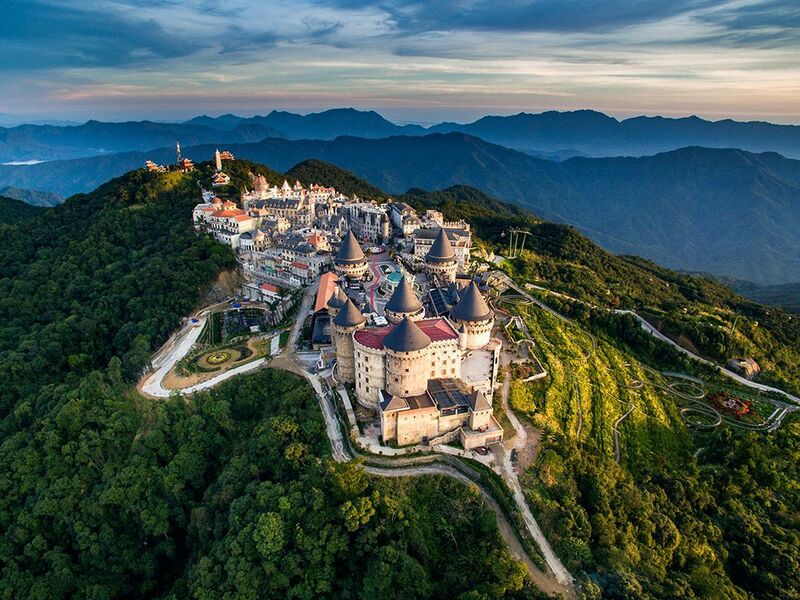 Nowadays, Ba Na Hills have turned into a totally top-notch tourist complex, constructed by Sun World Corporation. 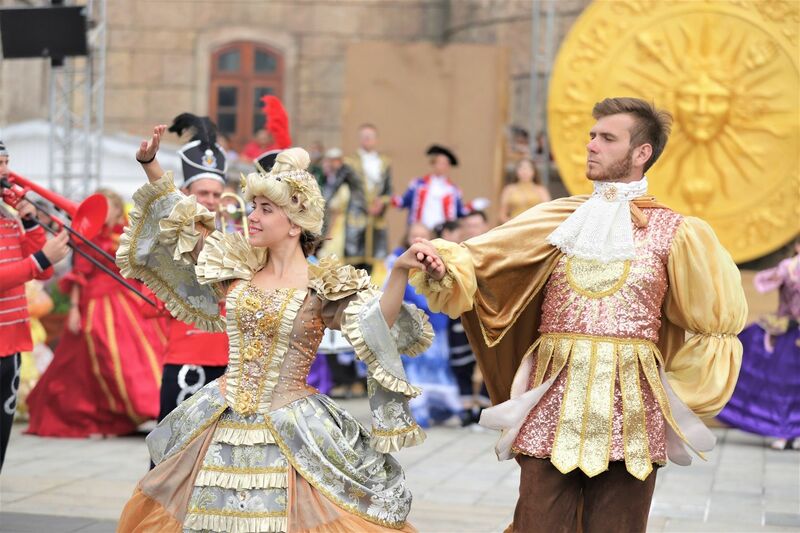 Coming to Ba Na Hills, you have the chance to admire the finest French architecture and enjoy most exciting entertainments. 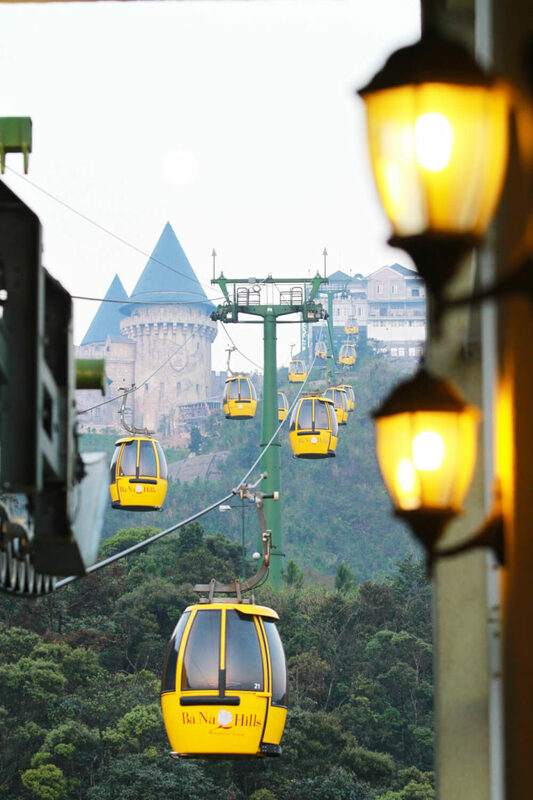 Visitors can only get to Ba Na Hills via cable cars. Ba Na Hills cable car system is one of the most impressive ten cable car lines on earth. The system holds many records including the longest gap, heaviest cable and greatest change in elevation. Taking this shortest line, you can visit Linh Ung Pagoda with the giant Buddha statue and take funicular to Le Jardin D’Amour – a lovely French garden. After that, take the Debay – Morin cable car to Chua mountaintop to visit resort complex and Fantasy Park. This is the line that holds several world records: longest one-wire sling, greatest elevation between station, longest unpatched wire and heaviest cable roll in the world. 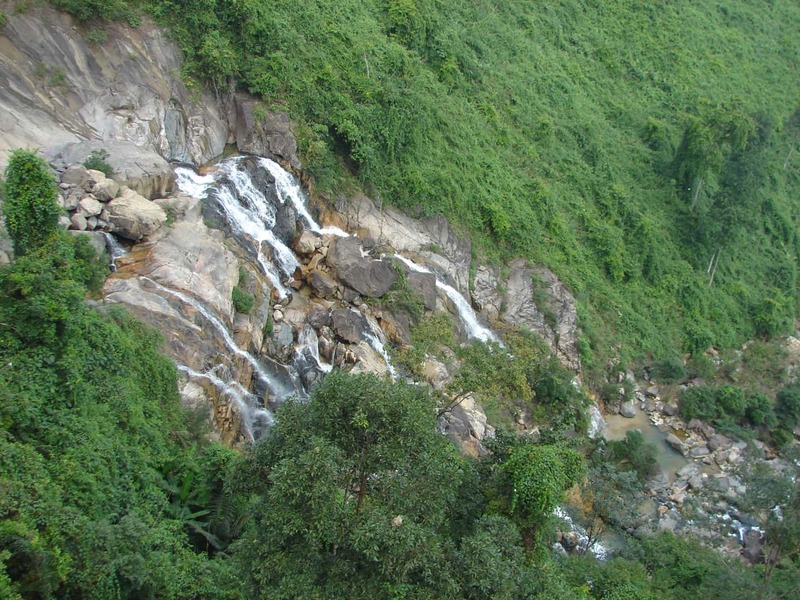 The ride takes you around 20 minutes and travel over the beautiful Toc Tien waterfall. From Hoi An Station, the cable car ride will take you to Marseille Station which is located just next to the famous Golden Bridge. From this station you must take a funicular to the garden Le Jardin D’Armour and Linh Ung Pagoda. To visit the mountaintop, take another cable car at Bordeaux Station. You might think the cable car fee is too expensive but actually it’s inclusive many activities you can enjoy on Ba Na Hills and the scenery during the ride is absolutely worth every of your penny. Especially, from the cabin you can admire the beautiful panoramic view of mountains and sea. For the cable car tickets and what are included, check Admission & Ticket Fees below! Golden Bridge, connecting the Marseille Station to Le Jardin Station, was famous even before its opening in 2018. And when it’s officially opened, the bridge has created a worldwide phenomenon and become as the most beautiful landscape on earth according to Time magazine. Why does Golden Bridge attract so much attention from tourists all over the world? The most obvious reason is its staggering appearance – a delicate gilded bridge being lifted by a giant stone hands covered in moss, with view overlooking to Da Nang city. It’s safe to say that Golden Bridge is the most instagrammable man-made construction in Vietnam right now. 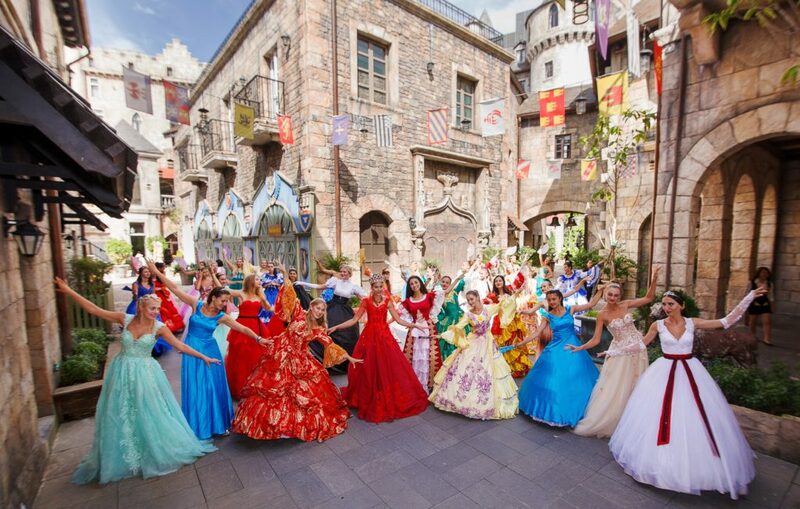 For the most gorgeous pictures, come to visit Ba Na Hills in summertime! 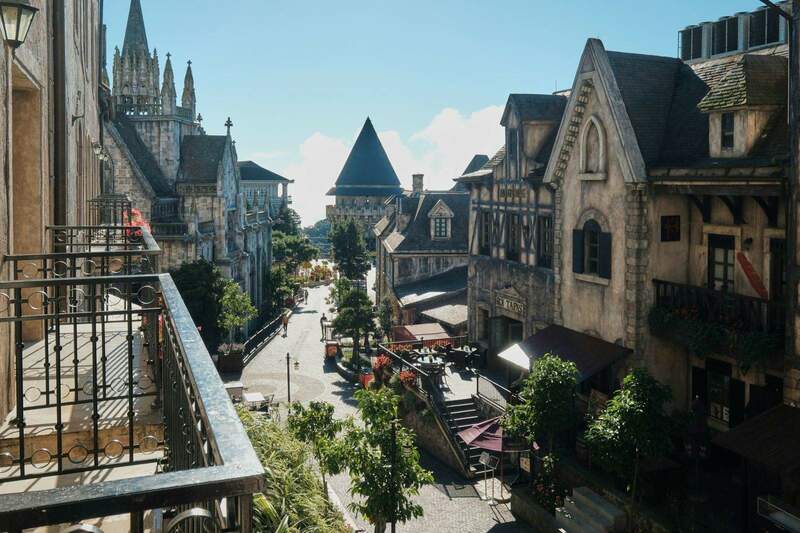 The French village in Ba Na Hills is a miniature Europe with medieval French architecture beautifully designed on every of its corner and alley. Any visitor would gasp at the sight of the village when see it at the first time. French village is a complete town complex that consists all most everything: a church, a square with fountain, shops, eateries and hotels. With little to none fusion with other architecture style and the cool mountain air, this place just makes you feel like you’re in Europe for real. Not only the architecture and the ambience, there are a lot street artists performing on the streets of French village. They’re more than willing to perform and take pictures with you. At night, these small yet gorgeous French town sparkles with the colorful lights on. If you want to stay longer at French village, Mercure Hotel should be your choice, not only for its luxury accommodation services but also because it look just like any other French building here, making feel like you’re not staying at a hotel but rather a local residence. >>> Contact us to enjoy better room rates at Mercure French Village Hotel! 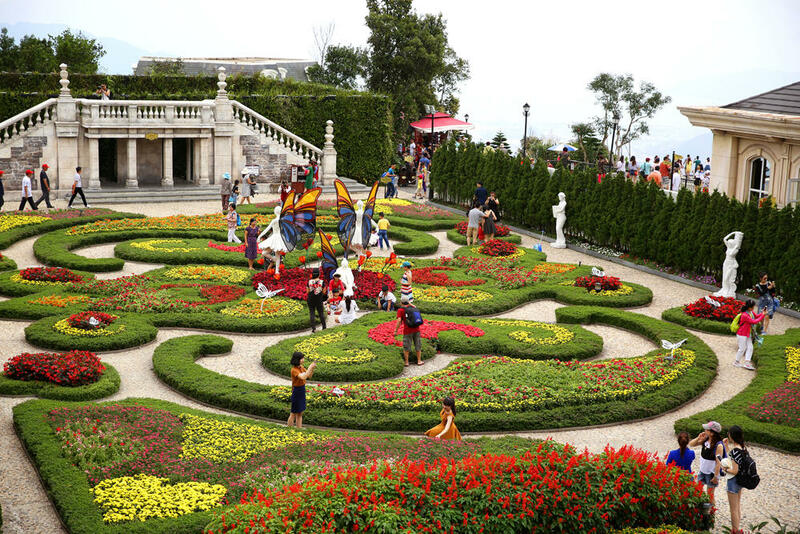 This beautiful garden is located at the lower part of Ba Na Hills, together with Linh Ung Pagoda, the giant Buddha white statue and Debay Wine Cellar. To get to the complex, you’ll take a short funicular ride. 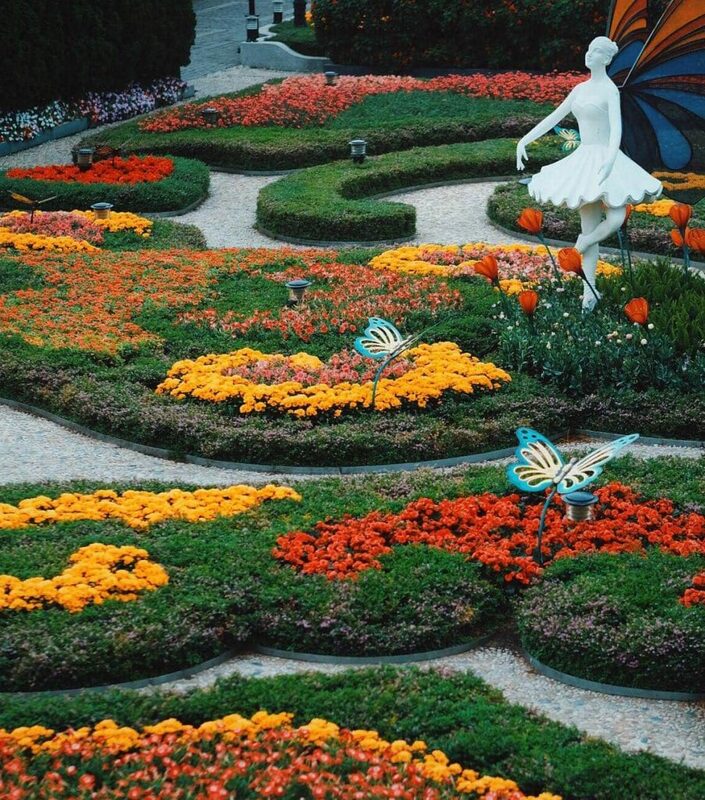 Le Jardin D’Amour welcomes you with its gorgeous beauty of 9 different gardens which tell 9 different love stories. This is the paradise of those who are fans of flowers and European architecture, you’ll have chance to admire the quintessence of them both. A harmony that will please every visitor who sets foot here. The nine gardens are: Love Garden, Mystery Garden, Legendary Garden, Memory Garden, Heaven Garden, Grape Garden, Brain Storming Garden, Dream Spring Garden, and Sacred Garden. Love Garden is the fairest among them all. 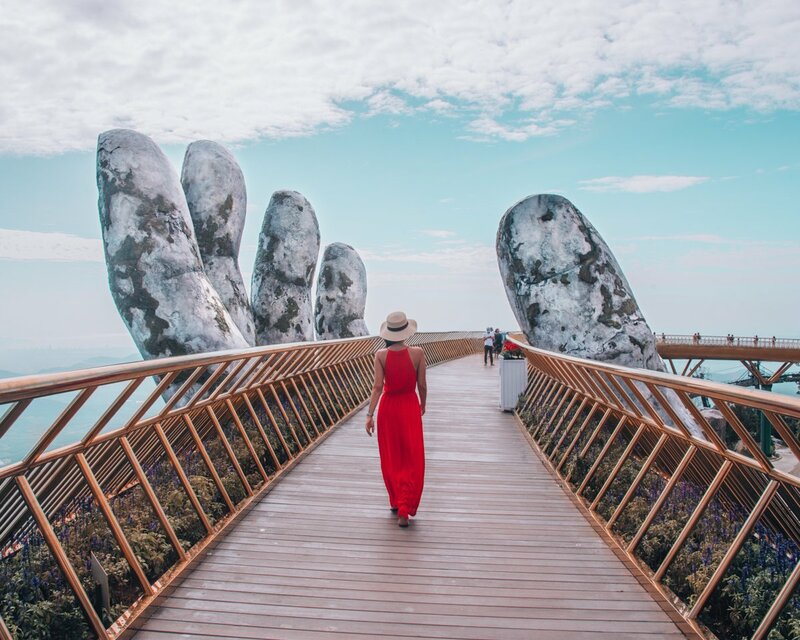 Located on a height of 1500m above sea level, right next to Le Jardin D’Amour Flower Garden, Linh Ung Pagoda is a great place to enjoy the panoramic view overlooking Da Nang city under a magical sea of clouds. The main feature of Linh Ung Pagoda is the giant white Buddha statue which can be seen from the flower gardens. On the front yard of the pagoda there is a special pine tree which is a Pinus kesiya, listed in the Red Book of Vietnam for its preciousness. 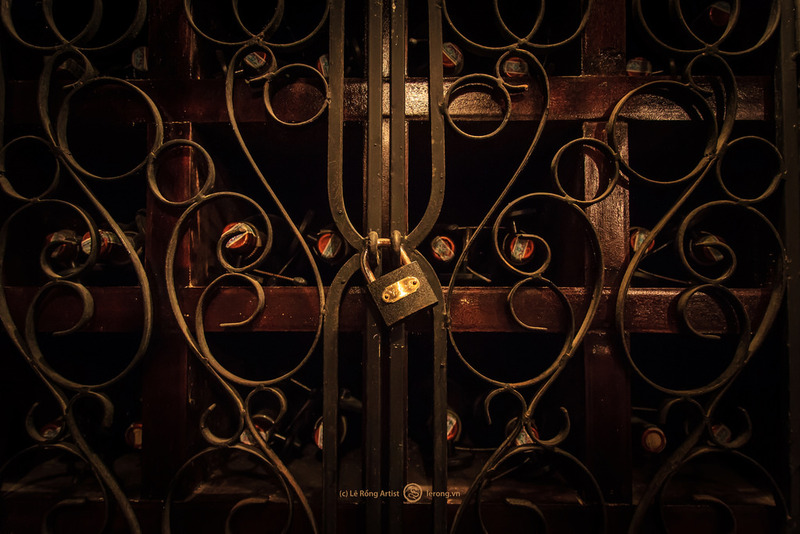 Since you’re at the garden, do not forget to visit the 100-year old wine cellar – Debay Cellar, built by the French in 1923. The cellar was dug in 100 meters long, through Ba Na Mountain, to maintain a continuous temperature of 16 – 20 degrees Celsius. A special material was used in the creating of the cellar you might never hear about. It’s litsea cubeba resin, in Vietnamese, called ‘mang tang’ which can only be found in this area. Come to this Debay cellar, you can enjoy the finest wine in Da Nang, and even Vietnam. 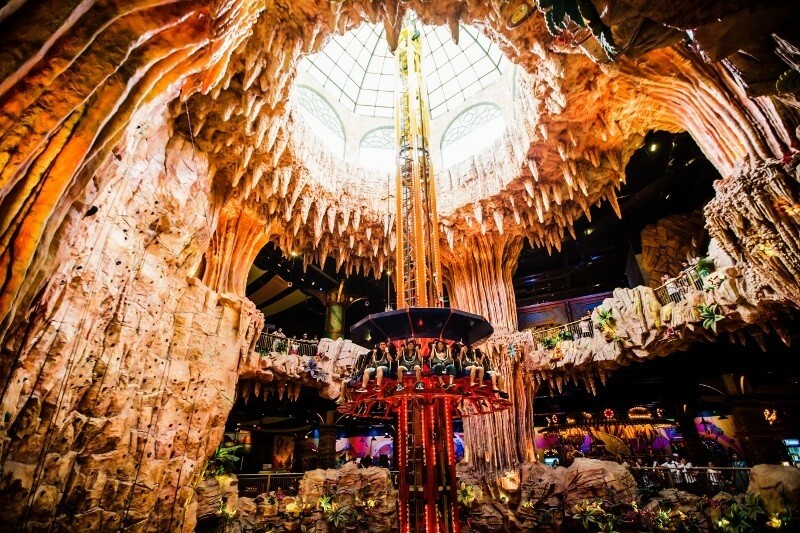 Take another ride to see Ba Na Hills Wax Museum which is the first of its kind that has been opened in Vietnam. The admission of the museum is not included in the cable car ticket, so you can choose to pay to visit it or not. 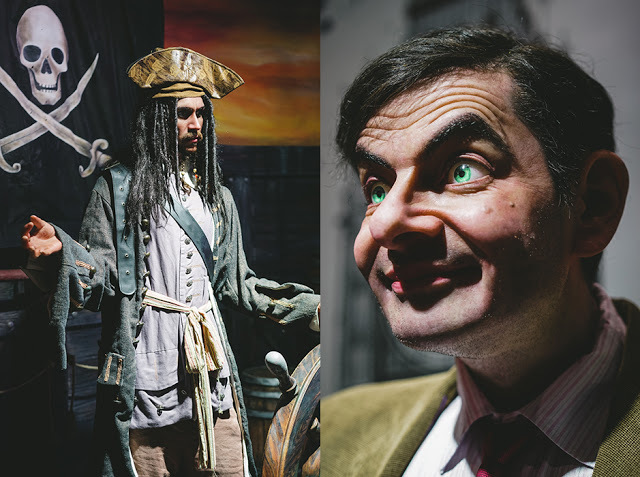 It’s quite worth it if you love taking picture of human-like wax statues. There are all kinds of famous people here: from politicians like Obama, British Queen, to famous celebrities like Lady Gaga, Marylin Monroe, to sportsmen like Messi and Michael Jordan. You’ll have a great fun here for sure. Before heading to Fantasy Park, why not have fun with Alpine Coaster? The fastest speed you can go is 40km/h, are you thrilled? The tubes at Ba Na Hills are winding up and down, going through the green forest of Chua Mountain. 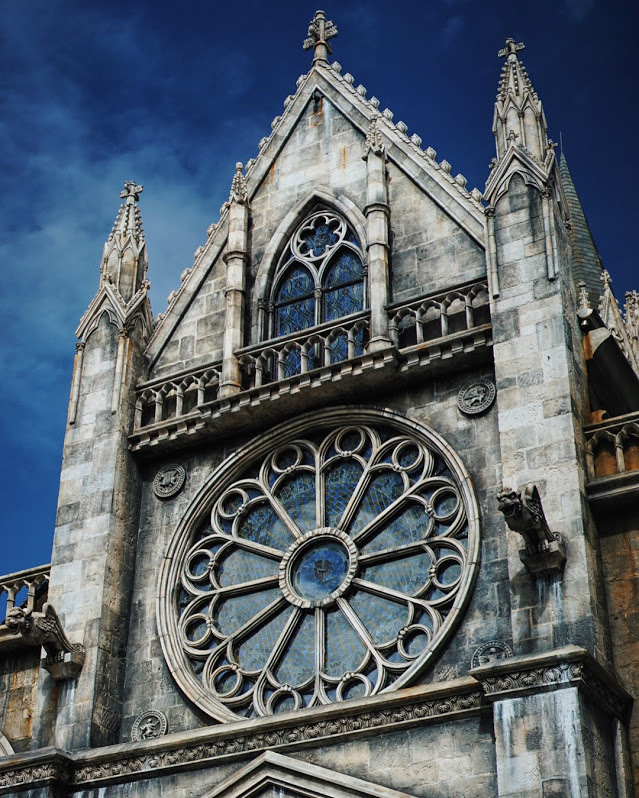 This is one of the things to do in Ba Na Hills you can enjoy with your kids. Inspired by two famous sci-fi novels ‘Journey to The Center of The Earth’ and ‘Twenty Thousand Leagues Under the Sea’, Fantasy Park is the perfect place to kill your stress and have fun with friends and family. If you love active, thrilling games, do check out The Drop Tower with a 29m freefall summit. You will see a delicate, beautiful glass dome before, without any warning, be dropped into a huge karst cave, the existence of which you can only imagine encountering in the kinds of book we just have mentioned. 4D Death Race and 5D cinemas are also things you shouldn’t miss out. Even if you are not fond of these thrilling games, there are over 90 games to spend your time here. One thing for sure, the architect of Ba Na Hills gets it. There’s nothing better than enjoy warm, fragrant cup of tea in a chilly place. Lying on the highest part of the whole complex, Tru Vu Tea Corner is a dreamy hangout spot for tea enthusiasts. The house was built based on the traditional architecture of northern Vietnam, fused with few elements from Japanese culture like square wooden table and Japanese sitting cushion. The view is exceptional as well. Just imagine sipping tea while looking out to the vintage French village laden with clouds with magnificent mountain backdrop. Ready for a 5-day tour in Da Nang and Ba Na Hills starting from just $425/pax? Enjoy a better deal with Asianway Travel when booking the tour above: we can offer much more attractive rates for your stay in Ba Na Hills (at Mercure Hotel). Contact us now for more information! 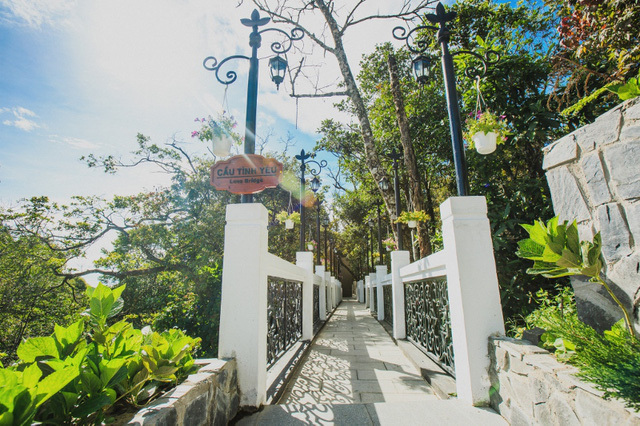 70,000VND ticket for funicular train to Debay Cellar and Le Jardin D’Amour. By Open bus: this option is much cheaper than taxi, costing only 120,000VND to 150,000VND for a two-way ticket and 100,000VND for a one-way ticket. By Motorbike: if you can drive motorbike, why not rent one and start your day trip to this lovely complex. On Da Nang, it’s easy to rent motorbike or scooter with price from 80,000VND – 150,000VND per motorbike per day. 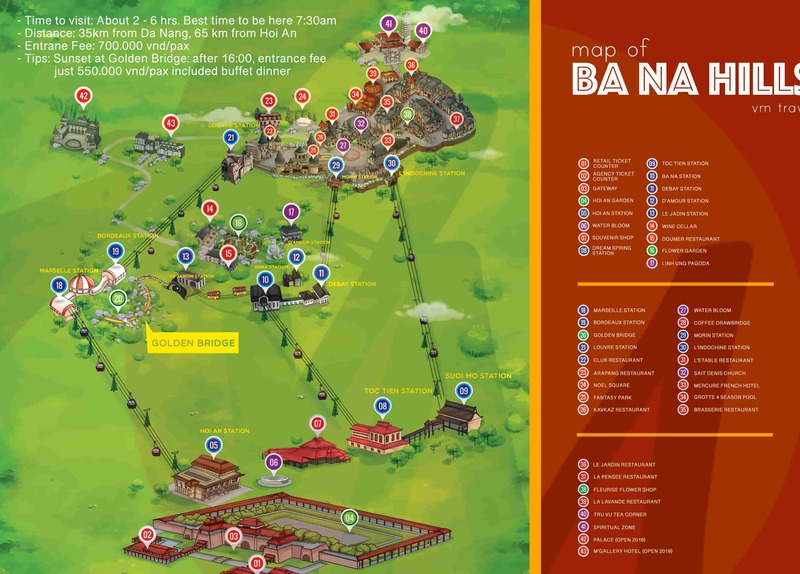 Follow the road Ba Na – Suoi Mo which will take you all the way to Ba Na Hills ticket counter. By Taxi: this is the fastest option, hence the most expensive. Expect to pay from 350,000VND to 500,000VND per ride for the whole journey. Cost reduces when travelling with group. If you’re vising Ba Na Hills to take pictures of Golden Bridge, come during April – August but it’s likely to be crowded with thousands of people, especially since Golden Bridge’s popularity has taken off lately. Sep – March is much better if you prefer quiet atmosphere and empty Golden Bridge to pose for your Instagram pictures. However, don’t forget to bring umbrella because in September and October it’s supposed to rain. It gets chillier once you get higher, so a light jacket would be perfect in rainy or foggy days. There are a lot of eateries and restaurants in French village so you don’t have to worry about bringing your own snack. You can watch sunset on Golden Bridge (after 16:00) with admission down to 550,000VND per person. Bottom line is Ba Na Hills is worth its massive amount of admission. The complex is just ideal for your family holiday to Da Nang, especially when you're travelling Vietnam with Kids! If you want to fit Ba Na Hills Day Trip into your trip to Vietnam, contact us for more information or send your request to booking@asianwaytravel.com.